I’ve been thinking this week about the similarities and differences among the various TV White Spaces (TVWS) pilots that are currently underway in Africa, in particular about Kenya and South Africa, my favourite countries to compare in terms of ICT growth and competitiveness. For the last few years, Kenya has offered a great stick to beat South Africa with. With strong leadership in the Ministry of ICTs and a thriving entrepreneurial sector, they have provided a striking contrast to the internecine battles and lack of progress in the ICT sector in South Africa. Happily, TVWS technology provides a counter-example where South Africa now leads the continent. In a few months I will mark five years of advocacy for TVWS regulation. My first blog post on the topic in September 2008 explored what was happening in terms of U.S. TVWS regulation and what potential impact that might have in South Africa. The issue was first picked up in the mainstream press in early 2009. By late 2009, I had begun to collaborate with the Wireless Access Providers Association (WAPA) to look for potential opportunities for change with the regulator (ICASA). We explored Lite Licensing, expanded ISM bands, TVWS, among other technologies. WAPA, in particular its chair Henk Kleynhans, became vocal advocates for TVWS spectrum. We formed the Open Spectrum Alliance which further brought the Association for Progressive Communications (APC) into a coalition of civil society organisations lobbying for regulatory change. Our strategy was to seek every opportunity to build mindshare for the idea of TVWS. You can see a list of articles published in the last 5 years which gives you a sense of how much work was involved in this. From late 2009 through 2010 we talked, we lobbied but not much happened. Then in early 2011, I was contacted by Ory Okolloh who had just joined Google as their Africa Policy Manager. She had picked up on a post I’d written suggesting that Google’s support for TV White Spectrum policy in the US could be extended to Africa to have even greater impact. With Ory now strategising with us, we decided on our next move which was to convene a workshop bringing experiences from TV White Space regulation elsewhere in the world together with regulators, policy-makers, and representatives from industry and civil society. This workshop took place in October 2011. We invited regulators from South Africa, Kenya, Mozambique, and Nigeria. Only CCK, the Kenyan regulator, declined to send a participant. Happily the Kenyan Ministry of ICTs and civil society group KICTANet were represented. Our timing was perfect as the South Africa regulator, ICASA, had already started to take notice of TVWS technology. 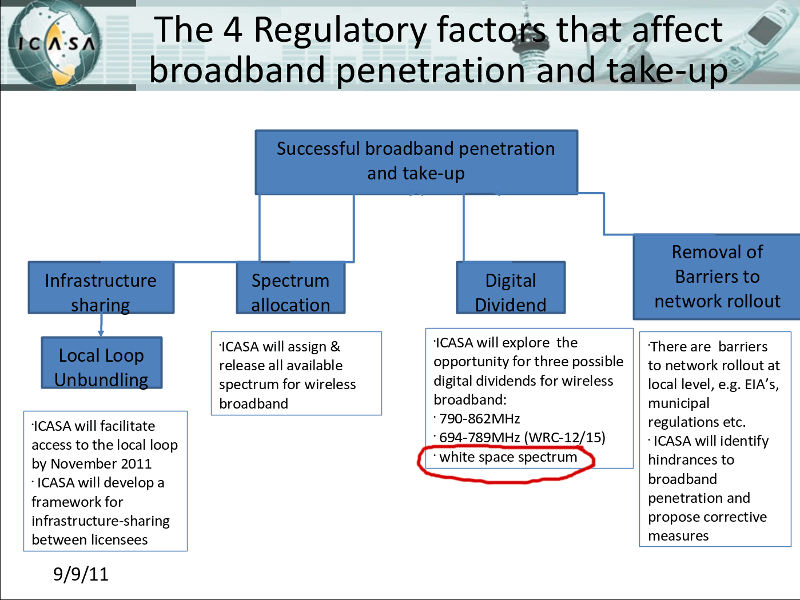 A September 2011 presentation on strategy from ICASA highlights “white spaces” as part of their digital dividend strategy. The highlight of the workshop was Google’s announcement that they would consider supporting a TVWS trial in South Africa. It is worth briefly pointing out why trials are important to TVWS regulation. Because TVWS technology is designed to operate as a secondary use of spectrum, it is critical to demonstrate that the technology will not interfere with the primary spectrum holder, the television broadcasters. There has been a lot of pushback on TVWS by broadcasters in the US who argued that TVWS technology would inevitably interfere with broadcast quality. A trial is essential for the regulator to have a body of evidence that shows that TVWS do not interfere. As time goes on and TVWS becomes more mainstream, it is likely that not every country will need to carry out trials as they will be able to draw on the increasing body of evidence from around the world. A trial is also important for the regulator to be able to assess the functioning of the TVWS authentication database that is the emerging default means of managing secondary TVWS use. As we considered the potential for a trial, two key questions emerged. One, what sort of trial should it be, rural or urban, commercial or government, small or large, etc. Two, who would manage the trial. WAPA was a possibility but as an industry association, it was really set up for operational project management on this scale. Google insisted on not managing the trial themselves as they wisely saw the importance of the trial being a fully South African initiative. Happily through my association with TENET, the National Research and Education Network (NREN) of South Africa, I was able to interest them in taking responsibility for the trial. This led naturally to a decision to connect schools in the Western Cape, bringing in a partner organisation to TENET, the eSchools Network (ESN). TENET hired Henk Kleynhans, who had by then stepped down as WAPA chair, as its project manager and Henk was succeeded by Arno Hart, who manages the trial now. This also became a great opportunity to forge an strong relationship with the Council for Scientific and Industrial Research (CSIR) who have taken responsibility for the accurate measurement of spectrum throughout the trial. And that is where my involvement stops. I relocated from South Africa to Canada shortly after the trial began and now simply cheer on the sidelines and look for more opportunities to advocate for shared spectrum approaches in Africa and beyond. Please forgive the somewhat “Steve-centric” description above. Think of me as just one of the blind men describing an elephant. The TVWS trial is the result of a truly collective effort with people from Google, WAPA, ICASA, CSIR Meraka, TENET, eSchools Network, APC, and ComSol all playing critical roles. My version of the Kenyan TVWS story is less complete as I have only observed this from a distance. In July of 2011, as we were organising speakers for the October TVWS Workshop, Ory and I were introduced to Jim Beveridge and Paul Mitchell of Microsoft who have been leading Microsoft’s work in TVWS for some time. Microsoft not only agreed to attend the October workshop but also to share a panel on spectrum at the the Internet Governance Forum (IGF) in Nairobi in Sept 2011. Microsoft were able to talk about their work in TVWS and also to briefly demonstrate TVWS technology at the event. I think it was at this time that Microsoft were able to connect with the Ministry of ICTs and CCK about TVWS. Once again, there was support from the then Permanent Secretary, Bitange Ndemo but little buy-in from CCK. Fast forward about 18 months and Microsoft have announced Mawingu, a TVWS initiative that is a partnership between Microsoft, Indigo Telecom, and the government of Kenya. USAID are also an important partner having contributed both money and equipment to the project but they don’t appear to get much of a mention. As I mentioned in a previous post, this project was inspired by one of the true pioneers of connectivity in Africa, Malcolm Brew. Years ago Malcolm was the CTO of Bushnet Uganda, a company building HF radio links into rural Uganda and the DRC to deliver email into areas previously considered inaccessible except by satellite. Having since moved back to the Isle of Bute in his native Scotland, Malcolm convinced British Telecom to run a TV White Spaces trial on the Isle. Paul Henderson, chair of Indigo Telecom, happened to call Malcolm and was amazed by the quality of their Skype call over the TVWS connection. He immediately saw the potential of TVWS and the result is the project you see today. One glaring fly in the ointment, however, is the fact that in spite of official support for this project from the Kenyan government, CCK are still reluctant to support the project in any way. To this day, as far as I know, the Mawingu project does not even have an experimental spectrum license to be able to carry out their trials. This is a pretty big deal. Without regulatory buy-in TVWS are going nowhere in Kenya. So what is behind CCK’s reluctance to embrace TVWS technology and regulation? One Kenyan gov’t representative I spoke to back in 2011 seemed to imply that TVWS was seen as an “American” technology that was being pushed on them. There is an element of truth to this. TVWS technology has largely been developed in the US and US companies do have an element of first-mover advantage with TVWS. However, Huawei are busy developing TVWS equipment and because it is standards-based, it is open to competition. That feels like a bit of a red herring to me. My gut feeling is that TVWS is, at best, perceived by CCK as an unnecessary added complication to the already complex Digital Switchover process. At worst, there is a lot of lobbying for television spectrum and I suspect that regulators are getting an earful from both broadcasters and mobile operators about why they should ignore TVWS. Happily this is not the case everywhere. In Tanzania, Microsoft’s pilot with Costech is going very well with full support from the regulator. In fact, on Wednesday next week, Prof. John Nkoma, Director-General of the Tanzania Communications Regulatory Authority (TCRA) is chairing a session on TV White Spaces at the Global Symposium for Regulators in Poland. I hope someone from CCK is attending.